Are all your greenhouses tucked up for winter? And all those poinsettias sold? Just think, you could be Christmas tree producers! Do we need another disease on chrysanthemums- especially one carried by thrips? Are growers seeing this in NYS? MSU’s research report on tomato spotted wilt on chrysanthemum. Oh goody, another chrysanthemum disease that looks similar to TSWV! This stem necrosis virus on chrysanthemum has only been seen in Korea so far. Whew! On the plant growth regulator front . . Information from Joyce Latimer at Virginia Tech on why PGR labels aren’t specific by crop. And e-GRO’s PGR MixMaster app to help you calculate amounts. There are lots of other reports on PGR application research at e-GRO, too. Oh, just one more beast to keep an eye out for – and aphids are likely to pop up earlier in the spring than we like – the foxglove aphid. Getting to be much more common in greenhouses. 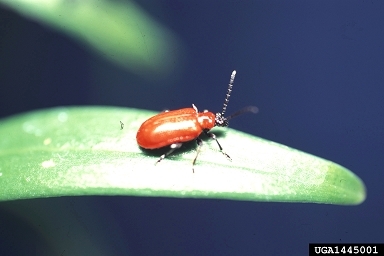 Well maybe another – broad mite in pepper. Do you have gnarly looking leaves? Look VERY closely for this pest. Some lovely sunny days lately! Have a great week!